As we started the day’s adventure – driving to the gorgeous stone-terraced northwest coast of the island and the small town of Banyalbufar – Tawnee described the road we were on as “Literally breathtaking!” A nice double-entendre because it was so narrow and steep that she was actually on edge. There are three wineries in this gorgeous, cliffy coastal village, which seemed odd — but it’s not: Here is where the rare Malvasia grape is grown to perfection. A bit about Malvasia: It grows well with coastal climate and mountain temperatures, and has been planted for centuries in Banyalbufar. A rare variety, it is also grown in Sardinia, Tenerife, and outside Barcelona in Sitges. Dry, it pairs well with fish, and white meats, and if allowed its sugars, makes a nice aperitif. This grape itself is high in sugar and they call it the generous grape, “La Generosa,” because it’s sugars allow a higher level of alcohol than most whites. 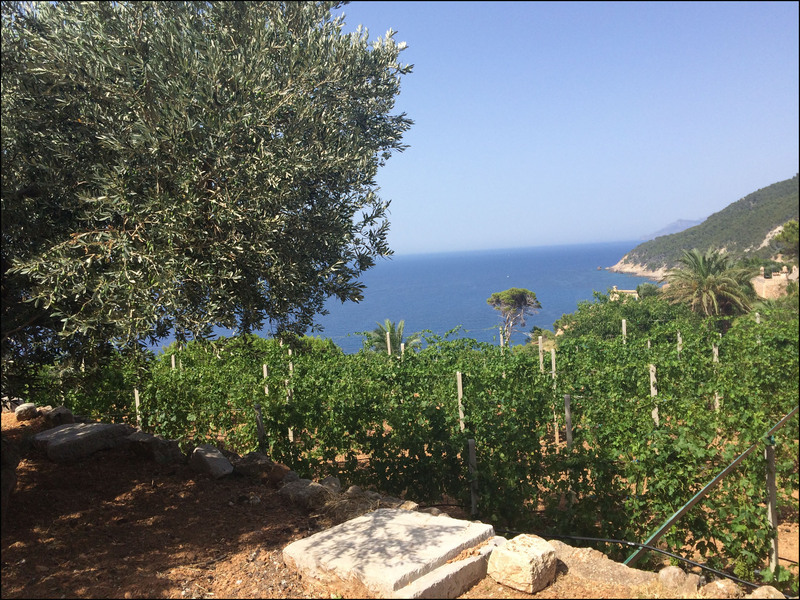 It is thought by some have been brought by the Phoenicians centuries BC, and to be the first grape on the island. It is certainly considered one of the few “natives.” Another name for the Malvasia grape variety is Malmsey. In the mid to late 1800s a nobleman, the Marqués de la Cenia, grew Malvasia grapes and made his wine here in Banyalbufar, and took it to Madrid where it was prized among the wealthy. He was a contemporary of the Archduke Ludwig Salvator of Austria who is famous for buying up and preserving wild areas of this terraced northern coast. 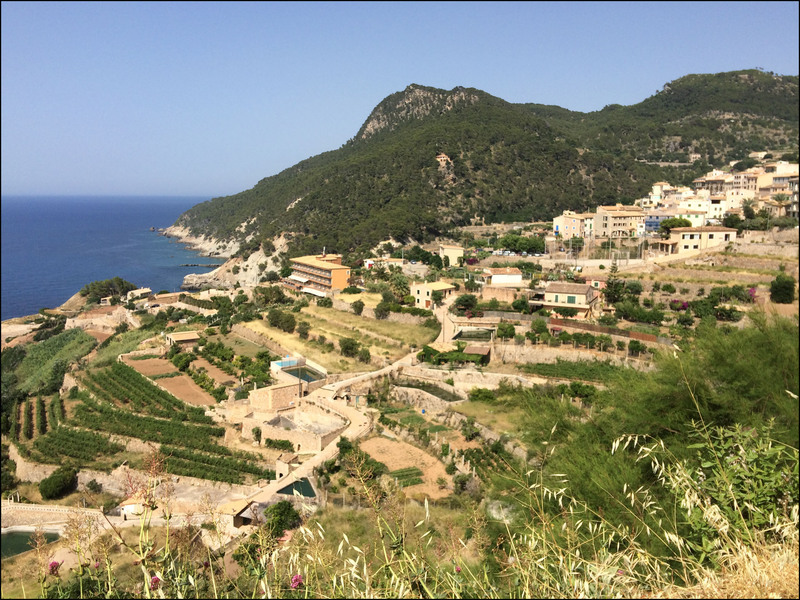 No coincidence, Malvasia is also planted miles away in S’Estaca, outside of Valldemossa, one of the Archduke’s notable properties and recently owned by actor Michael Douglas. So, our first stop in Banyalbufar was the Cellar Ca’n Pico winery. 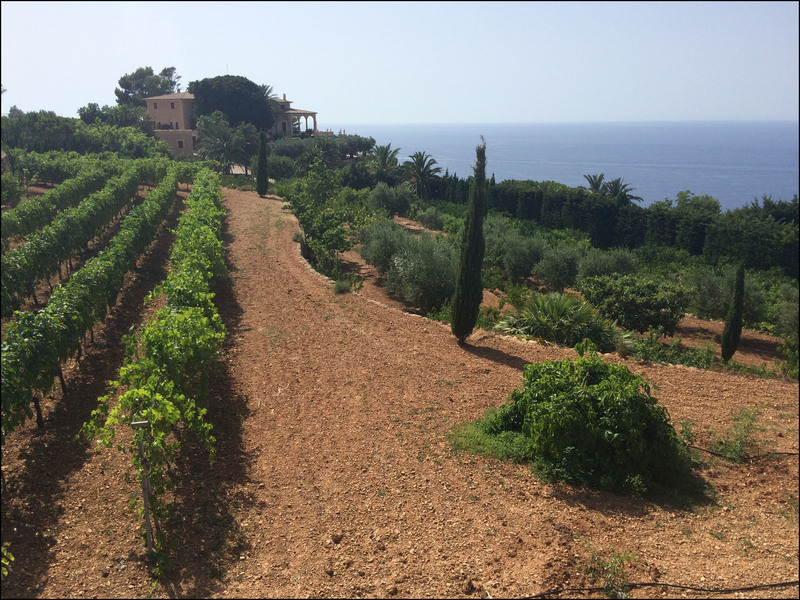 This is possibly the most beautiful vineyard in all Mallorca, perched on broad terraces overlooking the sea. 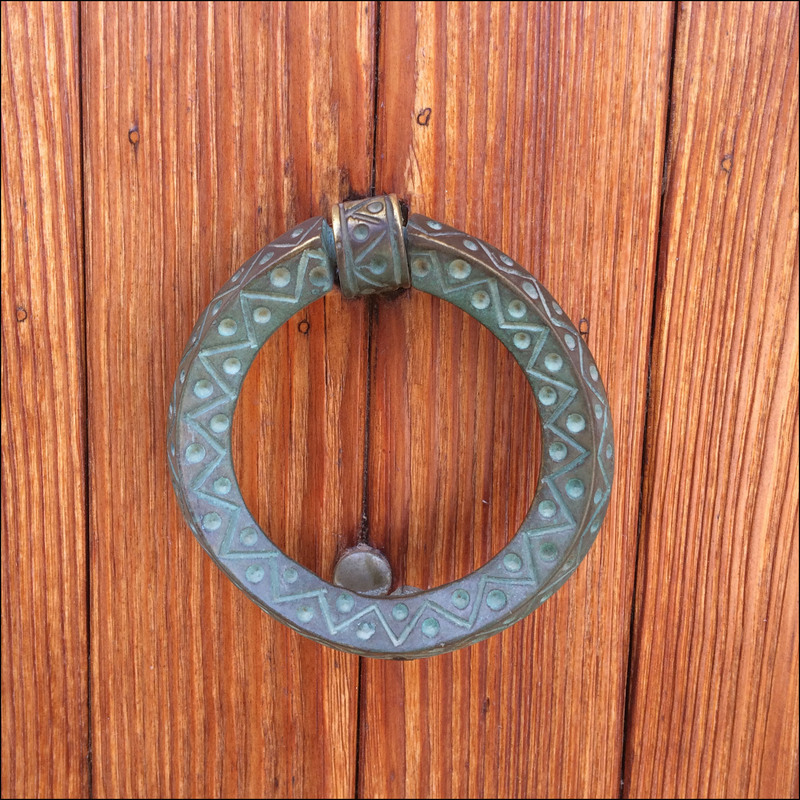 It is necessary to make a reservation for two reasons: 1) to schedule a visit (not set up for drop-ins) and 2) to make sure the gates are open so turning around on the narrow road is less stressful! 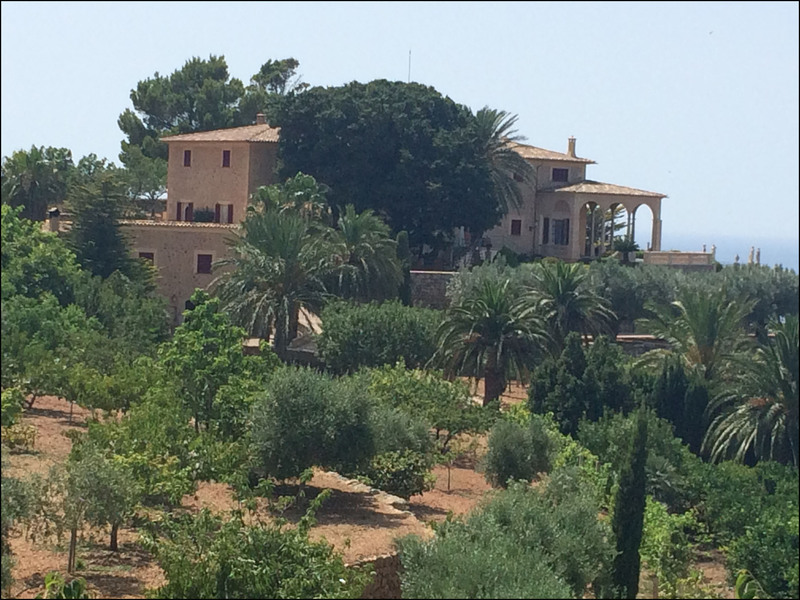 It seemed like we were pulling up to a private home, a grand old Mallorcan Estate (Finca). Well we were, and it turns out that all the wine production for Cellar Ca’n Pico takes place there at Finca Ca’n Pico, in a smallish Bodega that might otherwise be a large garage under the house. 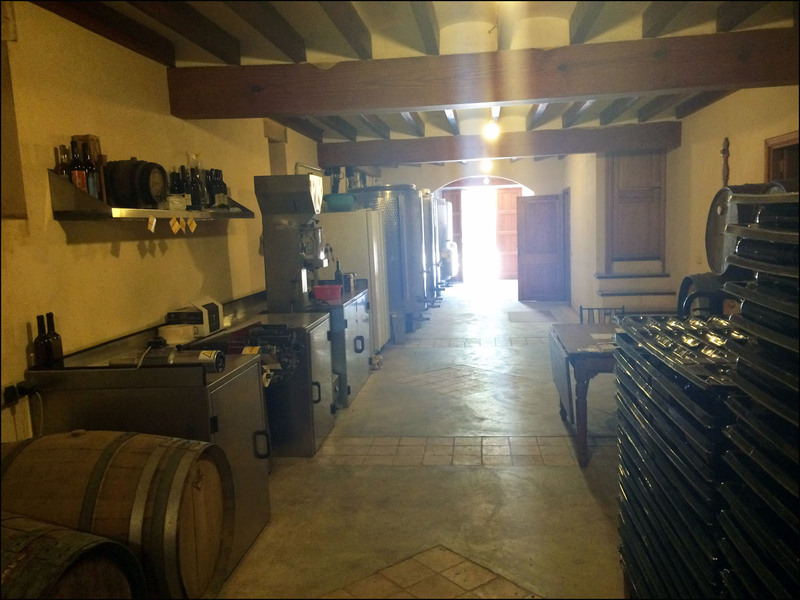 Our wine guide, the wonderful Juan Tomàs, met us as we parked, and opened the “garage door” to reveal a large stainless grape press and familiar steel tanks in the first room, then a tasting counter, bottles and barrels in the next. Tall and lanky with big brown eyes, Juan has been the “Bodeguero” at Ca’n Pico for 28 years since the current planting. They grow 80% of their Malvasia grapes right there at the terraced estate, buying a small amount more from other local vineyards. We spent a long time talking with Juan, and we learned so much! Like most others, this tour and tasting were done entirely in Spanish, no challenge for Tawnee! First Juan Tomas showed us ‘la prensa,’ a well-crafted Austrian press to carefully break the grape skins amongst whatever stems are present after a hand-picked harvest. Next they move the mash to temperature controlled steel tanks, cool so no fermenting takes place as the sediments and particulates fall. At that temperature yeasts are inactive, and in one month the grape juice is stable and clarified, ready for further production. 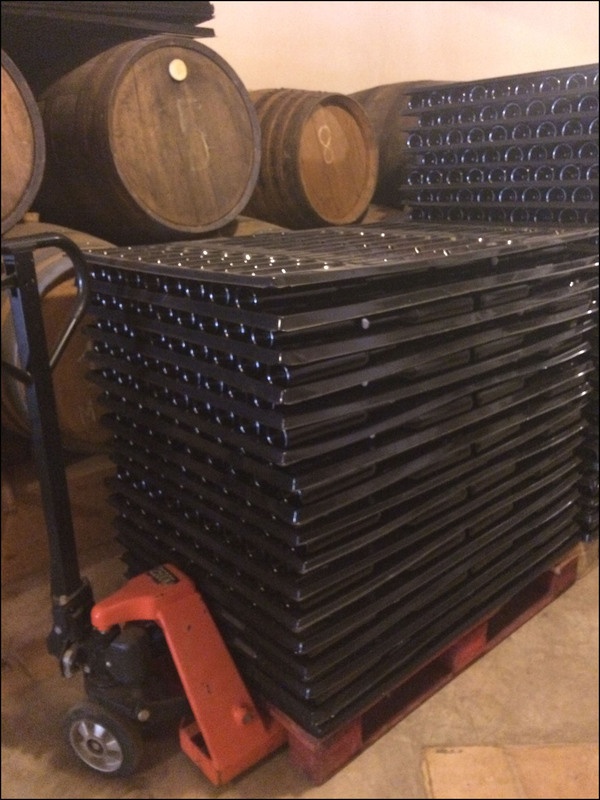 The whole process from growing to bottle is done here at the Ca’n Pico estate, “Aqui nos hacemos todo.” Some goes straight from fermenting tank to bottle, a small amount goes to Oak first. 1988 is the oldest bottle of Malvasia from Cellar Ca’n Pico post phylloxera blight. 150 years ago they had more vineyards. Then for the 30 years of phylloxera they had no vineyards, and sold almonds, olives, carob, and tomatoes. Juan told the story that during phylloxera, one man in the pueblo of Banyalbufar guarded and tended his few failing Malvasia vines and made his family table wine. After phylloxera a friend took a cutting and planted, as did another. But the product wouldn’t get above 12% alcohol, so it was making low quality wine. 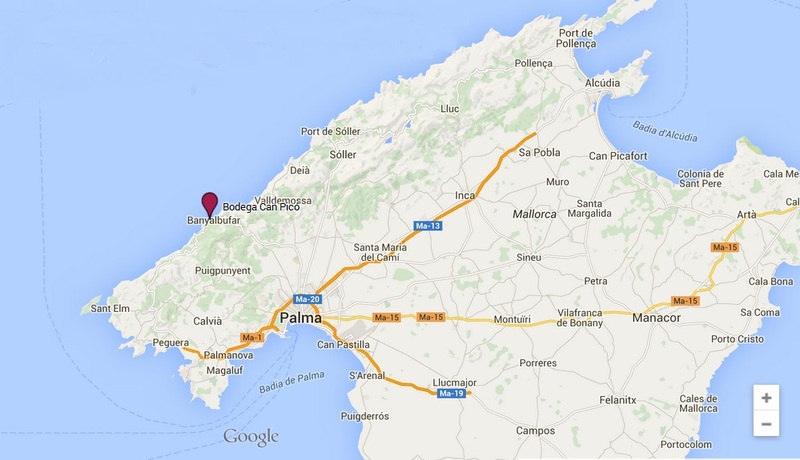 They added sulfites to stabilize the wine, and at the same time took cuttings of the vines to the local University of Baleares Islands (UIB) biology department and learned the vines had 5 viruses. The University worked on them for 10 years and created a strong and resistant strain they could replant, and those are today’s Malvasia vines of Banyalbufar. Ca’n Pico held out and kept some of those vines up until the 1950s when they took them all out. However, in 1980’s, Mr. Gabriel Canaves Picornell bought the farm and decided that with the help of our Juan Tomàs they would recover the Malvasia wine of the past. Through the advancements of science and passion they succeeded! They only produce about 5000 liters of wine every year, or 5000 bottles, and it is crafted to perfection. Making only one label and with one grape, 100% Malvasia, they might be the only true mono-grape winery on the island, making them doubly special – the most beautiful and the most specialized. We tasted the Malvasia at the cool summer room-temperature of the Bodega. We’d had the bottle perfectly chilled earlier that day in the local restaurant where we’d had lunch. Better served properly chilled I thought, but excellent at both temperatures. Tawnee loved this bottle enough to buy one there, and has it on her favorites list. Then Juan Tomas walked over to a far barrel, and lowering a length of hollow cane into a hole in the top of the barrel, he then sealed the top with his thumb to remove a serving of wine and released it into our glasses. It was the Malvasia Crianza Oxidativa, also known as Malvasia Generosa, which is made by the old method of the Marqués: It must be 16 % alcohol or more to bottle, because it is aged with air (allowing a % of air in barrel), and 15% alcohol or less becomes vinegar. It is much like Spanish Jerez, Sherry and Port in method and flavors. It is a sweeter wine. They do not produce it for sale at this time: Much work and little demand, so it is now for family and friends, a labor of love. Ca’n Pico began making it again in 1990 and producing a few in-house bottles in 2000. Juan told us that only a few decades ago, most Mallorcan wines were mediocre because they didn’t have the current technology of temperature control. Merie remembers that time!!! Especially with white, which must be around 10 degrees for first days of particulate separation, then ferment at controlled temperatures of 14-18 degrees. 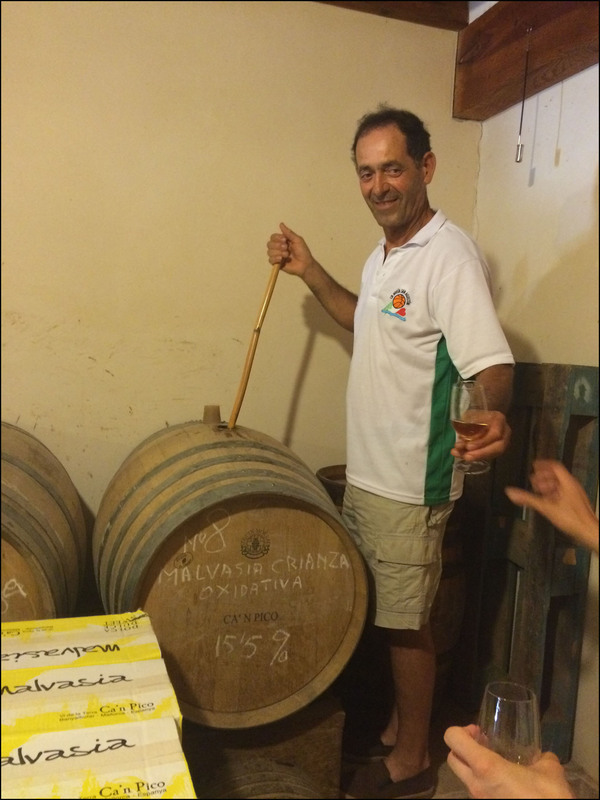 Of course Ca’n Pico used the traditional methods before Phylloxera, then replanted “recently” and instituted modern technology and methods, producing today’s tasty Malvasia label wine. After thoroughly enjoying our tasting and talk, Juan Tomas walked us around to see the closest vineyard terraces, and we basked in the beauty of this property, it’s breathtaking terraced seaside terrain and views. How to get there: Whe n you leave Banyabufar going in directions Estellencs you will see a sign for the Parking on the right. You take the turn directly before that. There is a little sign that says: Ca’n Pico on the stone wall. Yes, the road is narrow and no there are no barriers. It is an adventure worth taking to try their wine.